With the QLED 8K Signage at the forefront, Samsung showcases include The Wall in 8K and 8K HDR technology for LED signage. 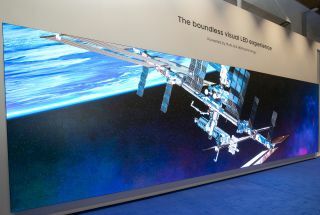 Samsung has launched the first signage products featuring the unmatched picture quality of QLED 8K at the Integrated Systems Europe (ISE) 2019 in Amsterdam. In addition to the QLED 8K Signage, ISE 2019 attendees will experience the future of display signage including The Wall 2019 and Multi-Link LED HDR technology for signage. Samsung will present the new 82” QLED 8K Signage, which combines the market’s highest resolution with Artificial Intelligence (AI) upscaling technology — producing lifelike images, enabling users to enjoy immersive viewing experiences. The AI upscaling technology in commercial displays will capture the attention of potential customers; and to store owners and advertisers, this means more content production at lower costs and lower resolution but higher resolution display in 8K quality. Similar to its 8K TV counterpart, the QLED 8K display delivers enhanced black color presentation through local dimming and Quantum Light Control. The display also features HDR10+ along with 4,000nit peak brightness and provides 100 percent Color Volume, presenting rich pictures. Samsung will also launch a 292” version of The Wall display in 8K globally in the first half of this year. The Wall is a large-format modular display ideal for luxury residences as well as for business purpose, configurable and customizable to a variety of sizes and ratios from 73” to 292”. The Wall’s slim, bezel-less infinity design allows the display to blend subtly into its surroundings. The Ambient Mode allows customization of the display by showcasing diverse content such as photos and art and matching the background to complement its surroundings. A customizable décor frame also allows the display look, sleek and sophisticated from every angle to fit any luxury space. To compliment the display’s visuals, Samsung works with industry-leading partners, including Harman Luxury Audio and Steinway Lyngdorf for sound solutions, Control4, Crestron and Savant for home automation solutions, and Domotz, Ihiji and OrvC on remote monitoring capabilities for channel partners. Samsung will introduce Multi-Link LED HDR, the industry’s first 8K LED HDR technology. Using Samsung’s proprietary algorithm and scene analysis, Multi-Link LED HDR turns any content into HDR quality, without special meta-data. Multi-Link LED HDR for signage delivers unparalleled image quality, featuring Inverse Tone Mapping (ITM) and Dynamic Peaking to maximize brightness and contrast ratio of the full screen by doubling peak luminance. Color Mapping feature also sets an adaptive color gamut for true and vivid LED colors. Moreover, Multi-Link LED HDR delivers live content with lower latency through an optimal live mode. It helps eliminate cable clutter of other displays with a 100-meter (330 foot) LAN cable. With the Multi 8K Frame Lock function embedded in Multi-Link LED, integrators do not require a separate device to sync content presented on 8K displays. Multi-Link LED HDR supports all Samsung SMART LED Signage products and is also compatible with The Wall Professional and the IFJ Series. Samsung will launch its semi-outdoor OMN/OMN-D series globally this year. These in-window displays available in both 46” and 55” sizes give businesses an eye-catching display solution with vivid and crisp content and excellent visibility, even in direct sunlight, with 4,000nit brightness and high contrast ratio of 5,000:1 all packed in a slim and neat design. The OMN-D series is a double-sided display that allows store-front and indoor display, increasing sales opportunities both in and out of the store simultaneously.With WiFi embedded and using one electric power cord and one LAN cable, the series reduces cord clutter and increases energy efficiency. Both displays feature dust-proof IP5X-validation and three-step overheat protection for durable performance, along with their own embedded solution, MagicINFO S6 powered by Tizen 4.0 for streamlined content management. The displays are optimized for a wide range of retail businesses from quick-service restaurants to department stores and more. At ISE, Samsung will also be introducing the new QMR and QBR series 4K displays that feature five models - 43’’ to 75” in size, an intelligent upscaling engine and IPX5 dust-proof validation, embedded with KNOX security solution and Wi-Fi for wireless management. Created with shopping malls, retail stores and airports in mind, QMR series has 500nit brightness and a non-glare panel. Made for smaller shops, commuter stations and terminals, QBR has 350nit brightness. Both series are upgraded from the last with smaller bezels and a more symmetric design.